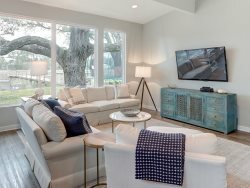 Modern conveniences await in this beautifully appointed, newly renovated Southern home nestled just off one of Savannah's famous, beautiful squares. As you step inside to the stone entryway, you'll enjoy the airy feel of the bright decor. The kitchen is stocked with everything you need to cook a romantic dinner atop stainless steel appliances and granite countertops. The master bedroom features a Queen sized bed, desk area, and a flat screen TV. The master bathroom has a clear glass and marble stand-up shower and a pedestal sink. The living room features plenty of seating around a decorative fireplace with a flatscreen TV and a cozy dining area for two. Outside, you can catch a cool Savannah breeze while sipping sweet Southern tea rocking away the summer nights on the rocking chairs on your back patio. The vacation rental offers everything necessary to enjoy your stay in the historic district of Savannah and has been around for hundreds of years. The home was originally built in 1838 and is the oldest home in Savannah south of Liberty Street. It was built in two stages – the original wood-sided portion (left side) was constructed in 1838 and the stucco portion (right side) was added in 1860. Lewis Bird, a prominent Savannah attorney at the time, began the original construction but sadly perished with his entire family on the Steamship Pulaski when it exploded off the coast of North Carolina and sank on June 14, 1838. Mr. Bird's mother completed the house and later sold it to his law partner Mr. Baldwin who lived in it for many years. As one of the nicer manor homes along Liberty Street in Savannah during the Civil War, the house was seized and occupied by General Sherman’s staff in December 1864 as part of their capture of Savannah during the infamous Sherman’s March to the Sea. Over the years, the house has been a private residence, a boarding house and a neighborhood tavern known as "Harry's Place." By the 1960s, it had deteriorated so badly that homeless people were living in it and it had caught fire several times – yet the house miraculously survived. • Goose Feathers Café – Voted “Best Breakfast in Savannah”. • Chippewa Square – Where Forrest Gump was filmed. very professional team members, great communication. The Bird Baldwin House is in a great location. I placed two phone calls prior to our visit with questions. Both handled very friendly and professional. Our cable went out on our first night. I called for service the next morning and a nice man was there withing 5 minutes and corrected the problem. We loved it. Staying in the Bird Baldwin home just added to the experience of visiting historic Savannah. We loved the location, the comfort and the plus of having parking. Being next door to the Savannah Roasting coffee shop didn't hurt either. Your team was so professional and in constant contact. When the hurricanes were coming through the area, we were kept up to date if there were any developments. I did have to telephone a person in the beginning for clarity regarding international credit card charges - and it was answered completely. The property is so well maintained, and the arrival/departure instructions were very clear - we really didnt need to do anything further. If you are looking for a clean, well maintained, quiet place to stay while you want to explore the city of Savannah - then, this is the place for you. The apartment was very well-equipped. The bed was very comfortable. The linens are spa quality. Kitchen is well appointed and has what you need. All the appliances are in working order. The shower is great too!! The floors have the original squeak - so you cant sneak the last of the pralines in the kitchen!!! We loved staying at the Bird Baldwin House and will definately stay there again when we return next year if it is available. Loved it! We loved our unit at the Bird Baldwin House. The apartment was amazing, very spacious! Parking was included. The mattress and bed were super comfy and the leather couch was as well. The tv had the best picture. We enjoyed watching Midnight in the Garden of Good and Evil on it one evening when our feet were just too tired to go out. ( added bonus Vinnie Van Go Go delivered the most amazing pizza) . The location was wonderful we were able to walk most everywhere. My husband and I explored together in the mornings and after lunch he would nap or tv watch and I would explore a bit more. It's was a pleasure staying at the Bird Baldwin. The property was beautifully decorated, with all the necessity. The location is ideal for walking to shops or sightseeing with the added bonus of on-site parking. We had a great stay. I highly recommend this property. Bird Baldwin was a beautiful little spot in the heart of of the most beautiful city in the United States. Members of the staff offered us the availability of the office to store our luggage until our rental was ready for check-in. That made it nice so that we didn't have to carry it around while we were exploring the afternoon we arrived. The Bird Baldwin house is a lovely place to stay while in Savannah! We were visiting to celebrate our 30th anniversary on a first trip to Savannah. The decor is great, and it exceeds expectations in terms of comfort. The location is wonderful and provides a short walk to many shops, restaurants and attractions. We thoroughly enjoyed our stay here and would definitely recommend! The website was so thorough and informative, along with your Youtube videos of all your properties, that it was easy to find out everything we needed. I appreciated your detailed and repeated email messages after the rental that had all the rental information in one place. It was a lovely, restful, beautiful and comfortably appointed property in an ideal location to appreciate the unique beauty of Savannah. I enjoyed the historical touches in the decor, the cleanliness, quiet, and spaciousness of the place as well. The cost was reasonable too. You thought of nearly everything that could make a guest comfortable. Hope to stay with Southern Belle again. The property is well within walking distance of shops and eateries. The apartment was well maintained and very comfortable. This was our first visit to Savannah and making arrangements through Southern Belle Vacation rentals made the planning so easy. Everything was well organized, from check in/out. The property was very clean and comfortable. We will definitely ask for the Bird Baldwin House on our next trip to Savannah. This is the second year we have used Southern Belle and have never encountered a problem with the team. Everyone is always SO accommodating, kind and wonderful. My family and I will stay at Southern Belle properties again and again and again. The property was absolutely beautiful and I don't think we realized at first what a great location we'd chosen but it is a great location! I was a little worrisome of the August heat as we've never been during the summer and wondered if the property would be cool enough but the weather outside was wonderful and the coolness inside of the property was a great respite when it did get blazing saddles hot (which wasn't often to me). We loved our stay this year and can't wait to try someplace different with you all next year, Lord willing! A wonderful property. Everything you need is included and the house was beautiful! Check in and out was a breeze and left us stress free for a wonderful anniversary vacation. The property was beautiful, clean, and in the perfect location to fully explore all that the historic district of Savannah has to offer! Kailey was super great to work with when planning our trip. She really listened to what we were wanting and helped us pick the perfect location for our visit. It was pretty amazing! The furnishings were comfortable and plentiful which was great for all our things. I like that the bathroom had plenty of lighting and space for all our (my) bathroom things.